See January, February, March, April, May, June, July, , and September. I have been going back and forth on this. Lately, I haven’t been doing so hot. I’ve done it a few times. Nope, but I really hope to do a major cleanup this month. It’s hard to keep it going when it’s not just your stuff, which I learned when trying to KonMari. Like last month, I didn’t get my full salary. But I hope that it will be possible this month. 7. Finish dissertation by end of July January/Finish draft of middle-grade novel by December. I’m still hoping to finish the dissertation–I plan to spend November doing that–but the middle-grade novel is on the backburner. My September goal was to stop drinking soda, and I didn’t do it 100%, but I did stop drinking at home, which is a huge step in the right direction. This month, I’m going to try to start following the Wolf chronotype schedule, which I will write more about in a future blog post. 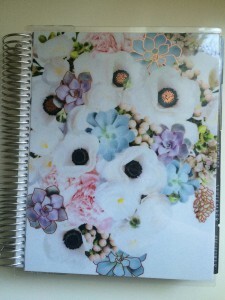 I’ve had my Erin Condren Life Planner for over a month now, and I’ve definitely been getting use out of it. I have a vertical planner, and have to decided to divide up the boxes into Work (freelance and my regular job), Personal Projects (things like this blog and Style Syntax), and Personal (stuff I need to do at home/appointments outside of work). 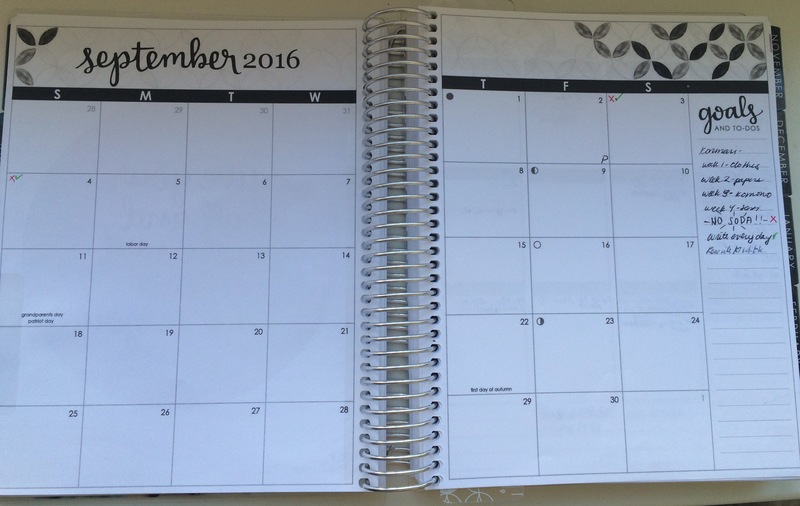 Using the Life Planner has definitely become a part of my routine, and it’s been especially helpful at work. I track not only the things I have to do, but write down what I do as I go along, so if someoone asks me what I did to Tuesday, I can turn to my planner and check. Before, I would often forget whether or not I had worked on a certain text. I also put post-its with reminders of things I need to check. I’ve also found it helpful for keeping track of my non-work goals. 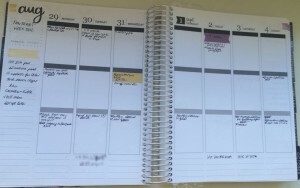 When I was actively working at home full-time and thus using my Filofax as much as I’m using my ECLP now, I would punch holes in a page from a memo pad and keep it in the middle of my week-on-two-pages spread. With the ECLP, I write those goals down the left side of the planner. Special monthly goals and goal tracking go in the monthly spread. So far, what I’m liking about the ECLP is that I don’t feel like I have to be as precious with it. I can just throw it in my work bag, and since I carry a backpack, the size doesn’t bother me. The layout also works well for me, since my life currently can be divided up nicely into three separate boxes. Right now, I’m basically using my Filofax as a place to store personal information and documents that I need, but don’t want to carry with me all the time. I could foresee that if the time comes when I’m not working outside of the house, like my situation last year, having two planners might seem extraneous and I could go back to my Filofax with whatever spread suited my needs. 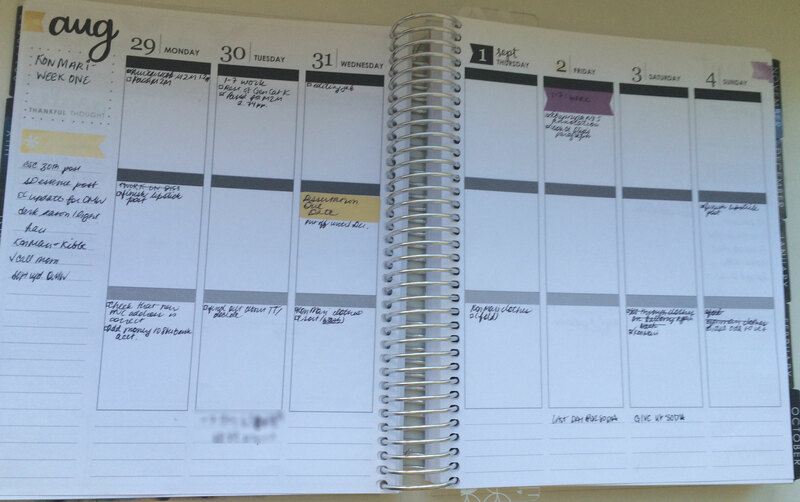 But for now, using a bound planner to do my actual planning seems to be working for me. The other thing I wanted to mention is that I made it over to Staples, planning to maybe pick up some Erin Condren things without paying for shipping. I left empty-handed, however, because $7 for four coil clips looks a little outrageous in person. It doesn’t feel that was when you’re on the website, because you’re not surrounded by much cheaper products by Martha Stewart and Cynthia Rowley. This brings up the question of whether the Life Planner is overpriced. I think it is, but I do really like it, so the cost won’t be a factor in my decision-making when I decide whether to purchase one for 2018. See January, February, March, April, May, June, July, and . I’ve actually been doing really well with this so far! I had to sacrifice three weeks of salary to take time off, so this isn’t going to happen. My new goal is end of January. I’ve started writing every day, but I’m not sure if it’s going to turn into a middle-grade novel, exactly. This month, I’m trying not to drink any kind of soda. It’s been hard, but not as hard as the other times I’ve tried to quit soda. I think before, I was letting myself drink Sprite, seltzer, etc., and somehow that’s harder than just giving up the entire class of fizzy beverages all together. See January, February, March, April, May, June, and July. I was doing fine with this while I was away. I was able to pretty much do this except for some shopping, which I think was deserved. I have $1000 now, but I wouldn’t say it’s exactly in savings. I’d want an additional $1000. I did NOT do this and will have to revisit this goal. 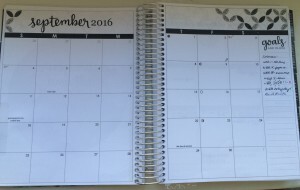 I know everyone has had their 2017 Life Planners for ages now, but I just got mine and since this is my first experience with Erin Condren, I thought I’d write about my reactions as a completely new customer. I wrote about why I was buying an Erin Condren last month. Update: In that post, I mention that the name is also on the back–I later found out that this isn’t true; the preview image just shows it that way for some reason. Anyway, my immediate reaction upon taking it out the box was that the cover is a lot higher quality than I expected. I was terrified of Erin Condren getting my ordered wrong, since I’ve seen a lot of people having issues. But even though the picture on the receipt showed a horizontal neutral layout, mine was the vertical neutral I requested. I didn’t notice any of the common problems–so far, I haven’t seen any wrong or missing pages, and since I didn’t get a coated coil, mine was fine. The one thing I do wish is that I had gotten my name on it. The middle of the front cover doesn’t have the rose gold foil on it, so it looks a bit empty. The back is all rose gold. 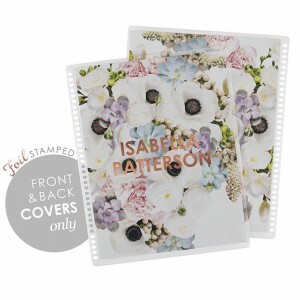 If this particular cover goes on a sale or something, I might get a second one with my name on it. You now have to pay extra if you personalize the cover when you buy it with the planner, which is annoying. That’s another reason why I didn’t put my name on it–the cost adds up fast when you starting selecting options. But we’ll see how I feel about it as time goes on. One thing I’ve never been able to understand from watching Erin Condren videos and so on is just how big they are. 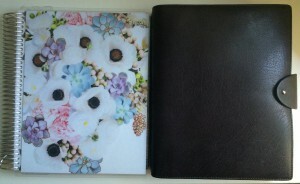 I knew the pages could fit in a Filofax A5, but somehow they always seemed like the size of a regular notebook to me. Here’s a comparison with my Charleston A5. Overall, I’d say I’m pleased with the quality. The vellum and cover feel more luxurious than I was expecting. I see the issues that people have mentioned with the image quality on some of the pages, but it doesn’t really bother me. I am very glad that Erin Condren has come up with a layout that isn’t as colorful–I didn’t like the bright circus colors they used to use, and I dislike the more muted palette they’ve been using even more. Now I just have to keep the habit of planning every day. See January, February, March, April, May, andJune. I did a lot better with this in June and for the most part kept to a normal schedule. I’d say I did pretty decently on this. I had some extra expenses that made this impossible. Hopefully I’ll be able to accomplish this! The June goal was a fail, and I didn’t make a goal for this month. I was always one of those people for whom school-supply shopping was basically Christmas in August. 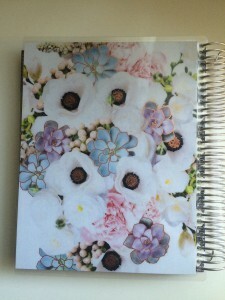 It’s only natural that the whole planner world/subculture would appeal to me. I’m generally disorganized and I have both a work schedule that varies week to week and freelance work. Plus, let’s face it, I like buying stuff. 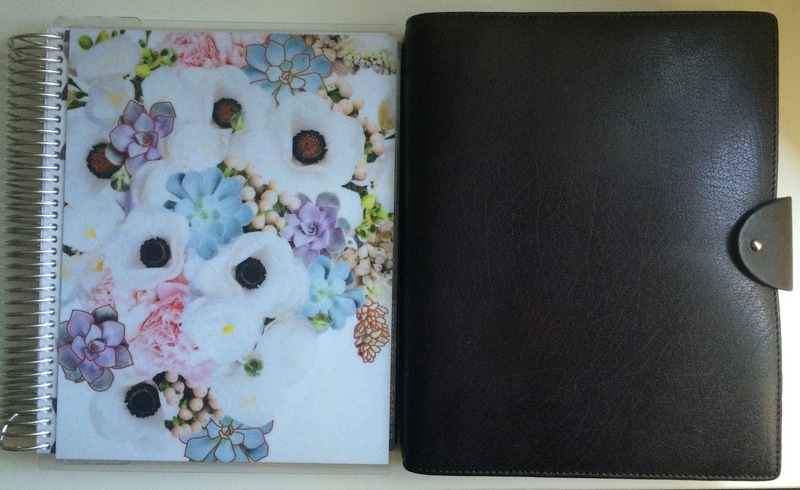 So when I discovered planners about a year and a half ago, I was immediately drawn to Filofax. You can get all kinds of inserts and really customize the insides to your exact needs. I didn’t find any design that really appealed to me, however, until I found the Charleston, which is sadly no longer in production. I also liked the Temperley Violet range, but knew I needed an A5. I found a Charleston A5 on eBay and then found a Violet pocket on deep discount at a local store, and I’ve been using these two planenrs ever since. The Violet I use as a wallet, and the Charleston mainly sits at home. Originally, I had thought it would be something I’d take with me, but the leather is so beautiful and scratches easily, and I also ended up putting in a lot of personal information and documents that I don’t necessarily want to carry around with me all the time. I had thought that I would use the Violet as an on-the-go calendar and then transfer things into my big planner later, but that hasn’t really worked out for me. So while I do use my Charleston as a catch-all and a brain dump, I’m not really using it for planning. It sits on a shelf, I take it down when I need it, I’ll sometimes write in when something is due or what days I’m working–but I’m not in the habit of sitting down and planning it on a daily or even weekly basis, and I’m not in the habit of referring to it regularly. It hasn’t really become an extension of my brain. 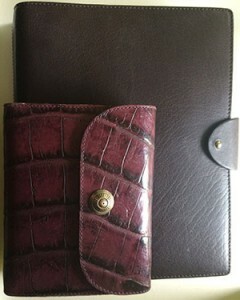 Now, I’ve always been a Filofax girl. The idea of being able to switch out inserts is appealing to me, as well as being able to move things around. 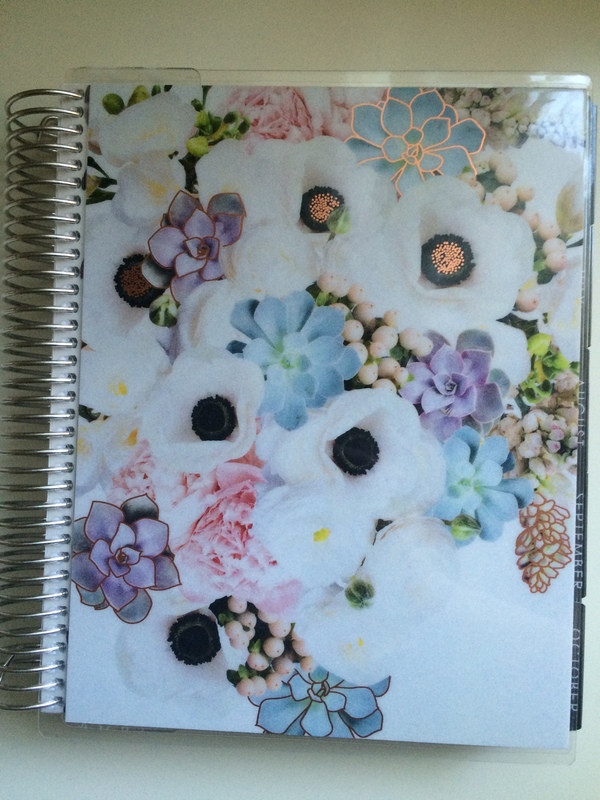 So the other major player in the planner game–Erin Condren–never appealed to me, since they make bound planners. And I never liked their aesthetic, with their bright color palette and inspirational quotes. But on June 1st, they launched their new line, which features a “neutral” version. It’s much more subtle, mostly gray and black with little touches of color. There are still some inspirational quotes, but overall, it just feels much more sophisticated. So when I saw a video with the new line, it stuck in my mind, and when they officially launched yesterday, I realized that instead of buying new Filofax inserts that I won’t use on a regular basis, perhaps I should try something new and see if I’ll get more planning use out of it. A planner that’s basically a notebook with a plastic cover is one I would feel comfortable tossing into my bag and taking everywhere with me, and the three-box vertical layout (which I could use for work, my own projects, and to-dos at home) seems like it would suit my needs. Plus it has things like a goal tracker, which is also something I would want from a planner. And when I saw that they had a cover featuring my favorite flowers, anemones, I was sold. So I ordered one. I didn’t get my name on it, because for some reason the name is also on the back in mirror image, which I find strange. I don’t think I’ll get it until the beginning of July, but when I do, I’ll share an update of how I’ve been using it and how I like it. Do I feel a little dumb for buying something that could basically be accomplished for something that I could pick up for $5 or $10? Yes. It’s expensive for what it is. I felt the same way when I got my Filofaxes. But I think there’s something to be said for treating yourself once in a while and buying the thing you really want, and not a cheaper version. See January, February, March, April, and May. I’ve been doing a little better in this department, especially recently. I was sick in bed for about a week, and somehow that reset my clock to where I’m pretty much living on a normal schedule. Most of this month was pretty bad, to be honest. The shelves I mentioned last month and the month before are installed, and they have helped, but I still have to do a major reorganization. I’m going to be doing a clean out of my stuff before the end of the month, so that should help, too. Yes! Some increases have made this possible for me to do. Not much progress, but #4 should help me get there. So far I’ve made two payments, both paying off the balance in full. The first go around (hey, I was in college), I thought of credit as “free money.” Now I understand that I have to think of it more like a debit card: If I don’t actually have the money, unless it’s a mega, super emergency, I shouldn’t use it. I have a credit card for rebuilding my credit and for added security when shopping, not to live on. I didn’t really do any work on this, but I’m not concerned because the dissertation length is basically the same as my end-of-term papers from college. I can take two weeks to research and a week or so to write and be fine. My May goal was to do my Pilates bar 4x a week. I actually did keep up with it until I got sick. My June goal is no McDonalds and to keep up with the Pilates bar. I actually already bought myself a present for accomplishing this June goal, and my hope is that having already bought something for myself will guilt me into actually keeping to it. McDonalds is an issue for me because it’s really the only place to grab something to eat in my neighborhood. So when I’m feeling too lazy to cook or just want to get out of the house, I end up going there. As you can imagine, you can use a Pilates bar every day and it won’t undo the damage that frequent McDonalds visits do. 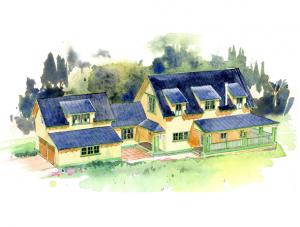 In my last post in this series, I talked about my favorite cottage-style houses. Cottage-style houses, though, often are pretty short on space. And while I don’t want a big house, I want my house to be big enough for the lifestyle I envision for myself. I have a few specific requirements. 1. A study. With any luck, I’ll continue working from home, and I want a work sanctuary I can line with books. 2. Four bedrooms. Master bedroom and two others on top floor, guest room with own bathroom on bottom. I don’t like the trend of the master being on the first floor, but I like the idea of a bottom-floor guest room with its own full bath for aging visiting parents (or parents living with me). 1. Private bathrooms and/or walk-in closets for the two rooms that would ideally be “kids’ rooms.” As I mentioned in my last post, I just don’t think kids should have their own bathrooms and giant closets. It’s like buying your kids a designer bag in high school. Save something for adulthood and make them share. 2. A formal living room. I just don’t think I would use it enough to justify having that space. There are few instances I can imagine where a family room/great room wouldn’t suffice. You have to buy expensive furniture and heat a large room to really use it maybe once a year, if that. I know people who have turned theirs into just a larger family room or turned half of it into a home office, but still. It’s just not something that I feel like I’d need. 3. A super-prominent, front-facing garage. You see this a lot with ranch houses, especially, but I definitely don’t want a house where the garage is in front and overwhelms the rest of the house. So I’m going to share the houses from my Pinterest that have intrigued me the most recently, in order from least-to-most favorite. I really love the view of the great room shown here. I think this house would work better on a big lakefront property, though. 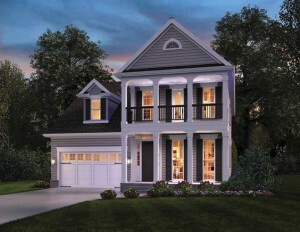 The front view, if you click on the link and look, isn’t that nice, with the garage. Overall, the exterior is kind of plain and it seems prettier on the inside than the outside. Looking at contemporary house plans, a lot of them seem to lack studies/libraries–I suppose it’s because having a closed-off room that isn’t a bedroom or a bathroom interrupts the flow of the open plan that most of them have. 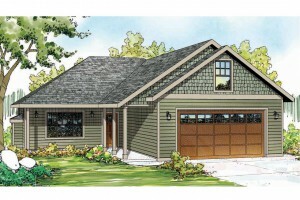 This plan is by a company called Perfect Little House, which has many cute, small and moderately sized house plans, as the name implies. This is their largest house, and I think it’d go nicely on a large rural plot of land. It fits all my requirements except for the office one. 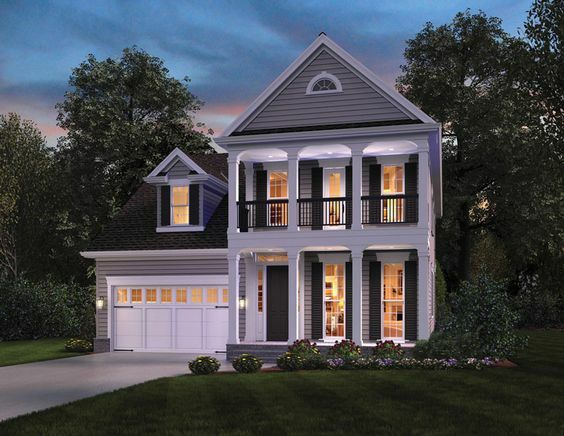 This plan has a built-in desk upstairs that could serve this function, and the designers suggest using the bonus room above the garage as an office. The bonus room is separate from the rest of the house, however, and can only be accessed from the garage–which I think is good if you want to have the offices of your business there, but not so good for someone who would like to work at home so they can combine working with being at home with the theoretical kids. The house so nice, I somehow pinned it twice. The site labels it “Southern/traditional” in style, but I think of it as vaguely Victorian because it reminds me of some of the houses in the downtown section of where I grew up (and would like to move back to) and my neighbors’ house across the street. I like the exterior of the house–all those balconies! And while the garage faces the front, the house itself is the one commanding the attention. But what I really love is that it fulfills all my requirements without wasted space. This one also has a bonus room over the garage, but it’s accessible from the upstairs. It has a separate office downstairs, one that would make use of natural light from the giant windows. It has just the right amount of space that I imagine I’d need, and no area that would go unused. What are your “dream” house ideas? See January, February, March, and April. So how did I do in April/what do I plan to do in May? I have made dinner, but not 3x a week, and I have been tracking my intake on and off with the Lose It! app. I plan to use Lose It! more often this month. I hope to buy the shelving that I mentioned in my last update sometime this week, and then I’ll let you know how this goes next month. I did pretty well with this, but see above–my salary doesn’t cover furniture. Have not done this yet… But hope to start really saving soon. It has arrived, I have charged $6.99 to it, and I will have no problem paying off that balance. May is the month that i will start really working on this. I will need to spend at least one day/week focusing on dissertation stuff. I did not accomplish my April goal, like, at all, which was not to eat fast food. My May goal is going to be to do a workout with my Pilates bar four times a week.